For as long as the railroads have been in existence, there’s been a need to transport passengers’ luggage, freight and postal mail between the depot and the baggage car. Probably one of the most common sights at any railroad station until the late 20th century was the baggage cart, the design of which really didn’t change much over the decades. 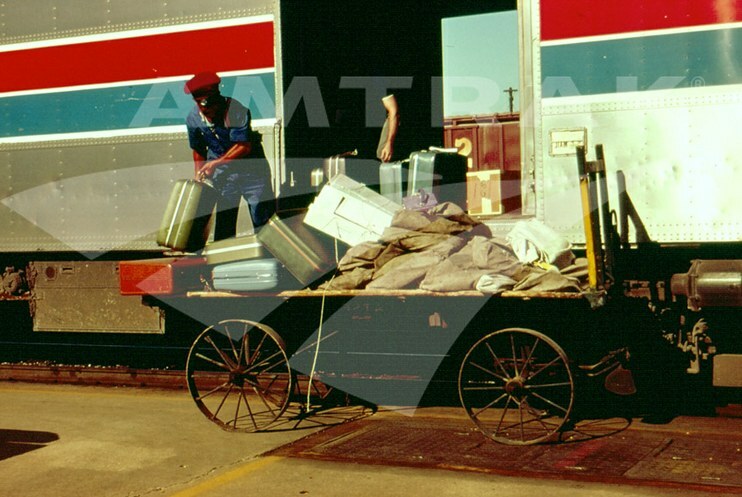 The photo above, taken in the 1970s soon after the formation of Amtrak, shows a scene that differs only slightly from what a passenger might have seen in the 1870s—suitcases may have replaced large wooden trunks, but the cart is essentially the same. Pulled by hand, the cart has a metal frame and a wooden base that was generally at the level of the baggage car floor, thereby making it easier for the baggage clerk to move items on and off the train. In large, busy stations, the carts might be battery powered to handle large loads. The clerk stood on a small platform at one end and pressed down on pedals to move the cart. Freight rooms had large wooden doors that slid open so that the cart, laden with luggage, crates and other goods, could be easily wheeled in for sorting. Security was always important to the railroads and the express companies; therefore, freight rooms usually had small windows situated high on the walls that allowed light to enter but deterred would-be thieves. With this in mind, it’s easy to pick out the freight area in a combination depot (one that housed passenger and freight services under one roof) by looking at the placement and size of the windows. Today, across the Amtrak national network, most of the older baggage carts have been retired in favor of carts attached to motorized vehicles. These new vehicles serve a double function, as they can carry passengers as well as pull the carts. Older carts do live on as part of museum displays, and a search of the Internet will find others repurposed for tables, unique stands for flowers and other uses. For model railroaders with an eye for detail, a cart or a figure of a baggage clerk pushing one down the platform adds that extra touch of authenticity that brings alive a model railroad layout. Baggage cart outside the Lamy, N.M. depot.